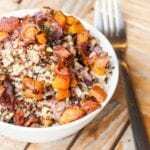 Bacon Quinoa with Sweet Potatoes – this gluten-free and dairy-free dish has soft and caramelized sweet potatoes and onions, balanced out with crispy and smokey bacon. Perfect for a weeknight meal. Bacon Quinoa with Sweet Potatoes was everything I loved in one tasty, balanced dish. I love bacon. There’s no other way to say it. It’s something about the crispy, crunchy, texture and smoky taste that makes it simply irresistible. I love it on everything, with every meal. There’s really nothing else quite like it and no easy substitute or replacement. That smokey flavor that crunch, that depth of flavor really is in no other food. I can see that I am clearly not the only one who feels this way. Just the other day my friend forwarded me an article about how the pizza chain Little Caesars has not released a pizza where the crust is completely wrapped in bacon. So with every bite of that crust you get a full chunk of bacon. Sounds pretty stellar and a brilliant idea if you ask me. Ok that may be going a little bit overboard – and I’m not sure I need that much bacon in my life, but I mean a little bit. I mean at 450 calories a slice I will pretty much only allow myself to eat this once a decade, but I can’t say I’m not intrigued in trying it out. Whether you want bacon on your pizza or around it, isn’t the discussion for today though, we’re talking bacon quinoa. Not sure why I hadn’t thought to combine the two earlier. I love bacon, and I love quinoa so it’s only natural the two should join and mingle to make a doubly delicious new favorite of mine. In this bacon quinoa recipe you only need a few star ingredients, bacon, sweet potatoes, shallots and quinoa. The bacon cooks first, and then in that delicious and flavorful bacon grease you cook the sweet potatoes and shallots. That way no flavor whatsoever is lost or scarified. The sweet potatoes and shallot with caramelize nicely in the flavorful bacon fact for an even stronger depth of flavor. If you’re on a quinoa kick like me you’re going to love this recipe. And you could always add in some more veggies here too. I have a feeling some sharp arugula would do well with this combination of ingredients too! Then you whisk up the three ingredient dressing, toss everything together with the quinoa, and that’s it, dinner is ready. 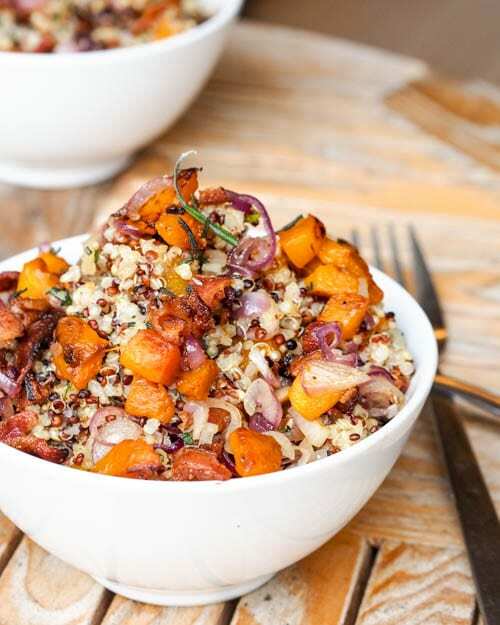 This bacon quinoa sweet potato dish is a great combination of flavors with the lightly caramelized onions, soft sweet potatoes and smoky bacon, all mixed in with fluffy quinoa and drizzled with a lemony mustard dressing. A gluten-free and dairy-free bacon quinoa dish with soft and caramelized sweet potatoes and onions, balanced out with crispy and smokey bacon. Perfect for a weeknight meal. In a pot combine quinoa and chicken broth. Bring to a boil, add salt to taste, and simmer, covered for 15-20 minutes or until quinoa is cooked through. Cook bacon in a pan until crispy on both sides. Remove from pan and drain on paper towels. Chop up the bacon into smaller bits. In the bacon grease cook the shallots until translucent and lightly caramelized. Set aside. To the same pan add the sweet potatoes and cook until soft. In a small bowl combine lemon juice, olive oil and mustard. Whisk until smooth. In a large bowl combine quinoa with the dressing. Add sweet potatoes, bacon and shallots. Mix. My new favorite! This is one of the best recipes I’ve ever tried. Thanks for sharing. So happy to hear that Kimberly : )) thanks for commenting to let me know! Can’t wait to make this! Thanks for sharing.